Nor’West winds that have high levels of positive ions. This can influence electro-chemical effects in the brain. Long car trips, air travel etc. It pays to prepare for Guy Fawkes a few weeks in advance as there are a number of herbal products that take a while to kick in that will make your pet generally more settled though there are a few that work within the hour as well . So for many families Guy Fawkes can be a stressful time especially when their beloved pets show signs of anxiety, stress and in some cases are paralysed with fear. More often than not, owners have little idea of how to comfort them. Stay home with your pet – they’ll be less stressed with someone they trust close by. Provide white noise running a shower is doubly effective because it increases the levels of calming negative ions. The shower often can be used as a ‘safe’ bolt hole because it can be completely closed with no exposure to flashing lights outdoors. Feed them before the fireworks start, a full stomach makes them sleepy and can help them relax. Increases tryptophan levels. Put a collar and registration tag on your dog – if your dog panics and bolts, it will help rescuers reunite you. 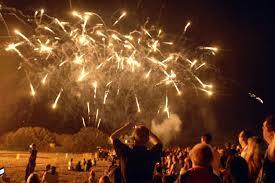 Move horses and farm animals away from fireworks – and make sure all fences are secure. Stable horses where possible. If possible stay with your horse during the critical times. Take special care of elderly or nervous pets – consult your vet for the best advice on keeping them calm. 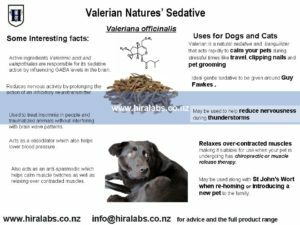 Products to Calm your Pet A range of products is available specifically designed to comfort pets during times of stress. The ‘Thundershirt’ is a pressure shirt of sorts, it provides a gentle, constant pressure that has a dramatic, calming effect for most pets if they are anxious, fearful or overexcited. Weighted blankets that may be placed over the pet can have a calming effect. Three basic ingredients are required for a thunderstorm to form: moisture, rising unstable air . The sun heats the surface of the earth, which warms the air above it. If this warm surface air is forced to rise and will continue to rise as long as it weighs less and stays warmer than the air around it. As this rises to freezing air, different types of ice particles are created from freezing liquid drops. The ice particles can grow by condensing vapour and when two ice particles collide, they bounce off each other, and one particle can rip off a little bit of ice from the other one and grab some electric charge. Lots of these collisions build up big regions of electric charges to cause a bolt of lightning, which creates the sound waves we hear as thunder. As the thundercloud moves around the surface of the earth, the portion of the earth beneath it is induced . When the electric field becomes strong enough, an electrical discharge (the bolt of lightning) is created, occurring between either different clouds or between a cloud and the ground beneath it. Electrons and positive ions of air are forced to go opposite ways, basically ripped apart. Thunder is a result of lightning. When the electrical discharge takes place, the discharge tunnel is superheated, causing the air to expand very quickly. Since this air moves quicker than the speed of sound, a shock wave is created, and then slowly dissipated. The resulting sound is thunder. 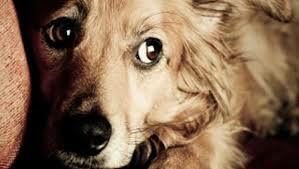 How do you know your pet is afraid? Try to “dig” while indoors, paw at you, bark or even act aggressively. The facial expression will be one of anxiety and he/she will adopt a cowering stance or roll up in a tight ball. Why are Pets Scared of Thunderstorms? Change in atmospheric pressure and fluctuations between positive and negative ionisation. Their human carers may be demonstrating fear and anxiety. This becomes a learned response and is established with every subsequent thunderstorm. What to do during a Thunder storm? Calmly reassure your dog when he’s scared as long as his behaviour is appropriate ie if he/she is lying quietly on his bed but not if he’s running around barking. Ignore and turn you back on that. It is essential that you speak slowly and calmly keeping the voice low. If possible distract your pet and keep your movements slow. Maybe try to temp with a favourite toy or titbit. Our dog’s ultimate treat is to curl up in my lap when I am on the couch. It is a rare treat but worth keeping for special occasions. These special treats are not meant to “reward” fearful behavior, they’re to distract your dog from the storm. Ideally you could ask her/him to sit or lie down first. Provide a safe place. Most pets like to crawl under a desk or to curl up in her kennel/crate if she prefers. Just wait until the storm ends before you try to coax a pet out of its hiding place. Make sure your dog can’t get out of the house or property. Keep all doors and gates locked, especially if you have to leave your dog home alone. Create ‘white noise.’ Which will help drown out the sound of thunder This can be done by turning on the TV, music, air conditioning or loud fans. Some music is able to help produce calming Alpha waves. Vivaldi’s Four Seasons seems to have the right ‘rythmn’ and composition to elicit this state. Bach and Baroque seem to have a calming effect too. These generally pulses between 50 and 80 beats per minute, which is close to the human heart. A thunder jacket can be used also. 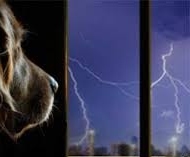 How can you prepare your Pet for Future Thunder Storms? Desensitizing your dog to storms. The idea is to slowly get your dog used to the thunderstorm noise so it eventually becomes no big deal. YouTube has hundreds of thunderstorm recordings to desensitizing to the noise but not chnages to atmospheric pressure. Do this by randomly playing the sounds softly without acknowledging your dog. No reaction whatsoever from you. Then gradually increase the volume over several days and weeks. Another option is to give your dog a highly valued food reward while you play the videos. This can be to distract your dog at first but also to help him associate positive experiences with the storm sounds. These may include those like St John’s Wort that gradually change the brain chemistry. Or something that is fairly fast acting like valerian to be given half an hour before a stressful event. THis acts on GABA levels in the brain to make the pet less reactive. Chamomile is another herb that acts more gently both on the stomach and the brain by acting on the GABA levels. Disclaimer: Information in this article is not to be used in place of professional medical advice and expertise. For diagnosis and treatment always see your health professional to carry out diagnosis and subsequent treatment. Herbal remedies must not be given not be taken in conjunction with other medication with out consulting a medical professional.